Love sushi but not a fan of how long it takes (not to mention the mess?) Today we’re making Mediterranean-inspired Greek Sushi rolls that take everything good about Greek salad and wrap it up into a delicious sushi rolls! Peel: Chop the ends off of the cucumber and use a mandolin or vegetable peeler to peel thin slices along, lengthwise. Set slices on a few layers of paper towels and cover with a few more. Pat to dry and let sit while you make the tzatziki. Tzatziki: To make tzatziki, combine, yogurt, lemon, garlic, dill, salt, and pepper. 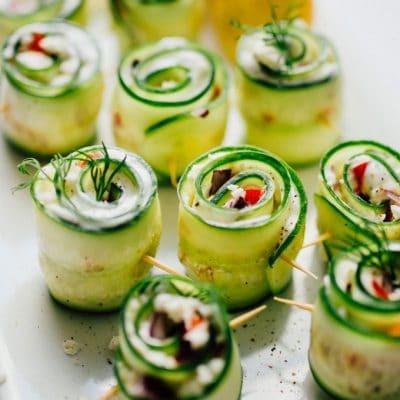 Roll: Spread some tzatziki onto a cucumber slice. Top with pepper, onion, and feta. Roll up and secure with a toothpick. Continue until you have used all your ingredients. Recipe from Live Eat Learn at https://www.liveeatlearn.com/greek-sushi/.